I love this programme. It’s like toast, you can always appreciate it, unlike cornflakes which you have to be in the mood for. Maybe it’s not the coolest of all sitcoms but definitely the warmest, comedy’s way of taking you on a relaxing stroll through the areas of your life you’d always be happy to get lost in and never return from. Not so much funny but heart warming, uplifting, unsurprising yet still a curiosity. Watching it is unchallenging and it’s difficult not to be fascinated by the simplicity of the characters and their relationships. I’m old enough to remember Britain before the supermarket. Well, not so much before them, but before they took over. So I remember when the corner shop was not just a convenience or desperation store but the focus of a community’s trade. It was the neighbourhood oracle, sentinel and night watchman all rolled into one. And in pre-1980s suburban England, if you couldn’t learn it in the local corner shop, it wasn’t worth knowing. In contrast with the faceless automated tills these days which greet and see you off with strange noise and printed receipt, the characters in your local grocer’s were for story tellers untapped gold mines. 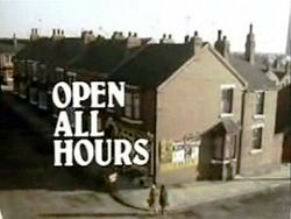 I guess this is why the very talented writer Roy Clarke chose a Doncaster corner shop as the setting for the four series of Open All Hours. It was just so close to home. And as that’s where the heart is, it’s what makes this programme so heart warming. Miserly workaholic Arkwright runs a small shop in Doncaster, England. Joining him are his nephew Granville and his fiancee Nurse Gladys who is essentially ballast, as most of the storylines revolve around the stuttering grocer and his lovesick errand boy. A lot of the humour relates to Arkwright’s occasional inability to complete words, just as much again to the way he uses this to put prices up. He is one of a dying breed, the hard seller on no commission who’ll take you for every ha’penny he can. The steady stream of shoppers fail constantly to buy and leave but become instead central to the plots and subplots of each entertaining episode, from the local would-be Einstein who comes in to correct the spelling on the shop window (oh, the temptation I’ve felt ever since to spell special with a ho) to the businessman who comes in to ask for directions. Nobody leaves without parting with some of their money and nobody leaves without marvelling at how they ever let it go in the first place. Riddled with idiosyncracies, Arkwright is also beset by a speech impediment (see the video, top right) which he mercilessly exploits in order to jer jiggle his prices. And you don’t get tired of the stammer, some jokes die at one telling, but the furfetching of the cloth is emblematic of the beauty of such a simple comedy. Even his selfishness warms you to him. His enduring attempts to keep his perennially single nephew away from the clutches of the local female population are hardly altruism at its most admirable, but the care of his shop cannot be left to him alone, the long-suffering errand boy and his desire both to climb the ladder yet leap off it is as much a part of the programme. In many ways I see myself in Granville, as do many men, his desire to attach himself to a soulmate yet the fear of the change it will bring about in life holds a mirror to many faces, and his desperation to change his circumstances is not matched by any great will or strength to achieve this. The final piece in the jigsaw is the romantically prudent nurse, Gladys Emmanuel, a figurehead in the community with a reputation to preserve. Imposing an extended and distant courtship on her beloved is her way of keeping the humour going. It allows us to laugh at the way we delay over things that would benefit us. A 57 year old single man with love but a mere secondary priority to penny pinching is not deemed fit to grace the master bedroom, and their interaction is a nice way to underline the character of the small businessman. 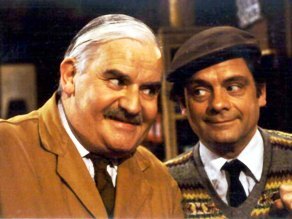 Two of the greatest British comedy actors ever, the late and very great Ronnie Barker, and the ever on time David Jason combined to breathe life into four series of Open All Hours, perhaps without them it wouldn’t have been the success it was, and still is. The BBC still shows it every year. And millions still watch. 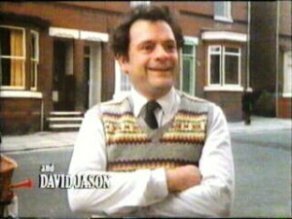 However un-British I may have come to feel, at times, over the years, some things still wave the Union Jack in my face, and Open All Hours is one of the very best.